Where we’re at, up inland, I missed those dances; I wasn’t born, you know. I was too late, but my dad, he caught the Eskimo dance before they did away with it. When the missionaries came, they did away with it…That’s what they did to them, see? …But he told me about the dances and how they used to do them when my grandpa [was alive]. Iñupiaq dancers wore masks during traditional hunting ceremonies and at Messenger Feasts; shamans out them on to represent supernatural beings that assisted in healing and magic. The story of this white-painted image of man’s face is a mystery. The mask was reportedly obtained on St. Lawrence Island by C. L. Hooper, captain of the U. S. Revenue steamer Corwin, in 1881. The location could be correct, since a St. Lawrence Island artist named Nemaayaq was known to carve masks even though they were never used in Yupik ceremonies. 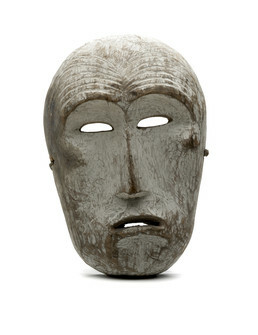 However, the mask might have instead come from one of the coastal Iñupiaq villages where the vessel also called. The wrinkled brow probably represents age.